Dominion has announced that it would grow its clean energy portfolio by developing a fuel cell power generating facility in Bridgeport, Conn. Dominion acquired this development from FuelCell Energy Inc. of Danbury, Conn. The facility will produce 14.9 megawatts of electricity – enough to power approximately 15,000 homes – using a reactive process that converts natural gas into electricity. “The Dominion Bridgeport Fuel Cell is another important step in our efforts to identify and develop opportunities to produce clean energy that is reliable and cost effective,” said Thomas F. Farrell II, Dominion chairman, president and chief executive officer. 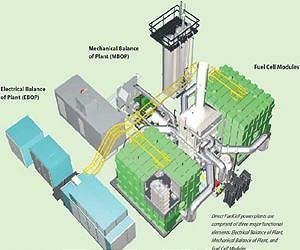 Read more: Dominion To Develop Largest Fuel Cell Power Project In North America — Space Daily.